This video protocol illustrates the squash technique used in the Johansen laboratory to prepare Drosophila polytene chromosomes for antibody labeling. Cai, W., Jin, Y., Girton, J., Johansen, J., Johansen, K. M. Preparation of Drosophila Polytene Chromosome Squashes for Antibody Labeling. J. Vis. Exp. (36), e1748, doi:10.3791/1748 (2010). Drosophila has long been a favorite model system for studying the relationship between chromatin structure and gene regulation due to the cytological advantages provided by the giant salivary gland polytene chromosomes of third instar larvae. In this tissue the chromosomes undergo many rounds of replication in the absence of cell division giving rise to approximately 1000 copies. 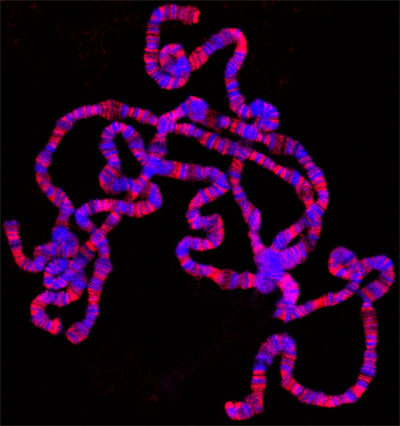 The DNA remains aligned after each replicative cycle resulting in greatly enlarged chromosomes that provide a unique opportunity to correlate chromatin morphology with the localization of specific proteins. Consequently, there has been a high level of interest in defining the epigenetic modifications present at different genes and at different stages of the transcription process. An important tool for such studies is the labeling of polytene chromosomes with antibodies to the enzyme, transcription factor, or histone modification of interest. This video protocol illustrates the squash technique used in the Johansen laboratory to prepare Drosophila polytene chromosomes for antibody labeling. The following protocol for polytene chromosome squash preparation is adapted from the procedure described in Johansen et al. (2009). In order to obtain optimal polytene chromosomes for high quality squash preparations, uncrowded culturing conditions are essential (i.e., place around 20 egg-laying female flies in a standard 4" fly bottle and change to a new bottle each day). Select the fattest individuals from the first crop of climbing 3rd instar larvae while they are still wandering but just prior to pupation. 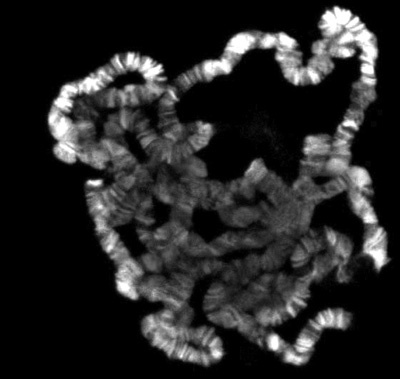 We routinely culture at 21°C but 18°C will yield fatter chromosomes that may be more suitable for some purposes such as for example when band/interband regions need to be visualized at high resolution. 5X formaldehyde stock. Prepare a fresh solution of 0.74 g. paraformaldehyde in 4.0 ml of dH2O and with 28 μl of 1N KOH. Warm to 65°C to dissolve the paraformaldehyde and then store on ice. Fixative 1. Prepare a fresh solution of 0.5 ml 10X PBS, 50μl Triton X-100, 3.45 ml dH2O and 1.0 ml from a 5X formaldehyde stock. Warm to disperse the Triton X-100 and use within 1 hour. Fixative 2. Prepare a fresh solution of 1.5 ml dH2O, 2.5 ml Glacial Acetic Acid, and 1.0 ml from a 5X formaldehyde stock and use within 1 hour. Lactoacetic acid solution. Prepare a solution of 1 ml lactic acid, 2 ml dH2O, and 3 ml acetic acid. Rinse larvae with water and transfer to PBS in a tissue culture dish for dissection. Grasp the tip of the mouth hooks with one pair of forceps, hold the body about 2/3 of the way down with the other pair, and pull on the mouth hooks so the salivary glands are exposed. Separate the salivary glands from the brain and eye-antennal discs, and dissect away the fat body and any other associated tissues from the glands. Using forceps transfer the salivary glands to Fixative 2 in well 2 and incubate for two minutes. Transfer the glands to 10-30 μl of Lactoacetic acid solution on a clean Sigmacoted coverslip. Gently lower a polylysine-coated microscope slide onto the coverslip and, without applying vertical pressure, pick up the coverslip so the glands are between the slide and the coverslip. Immediately facilitate cell lysis and chromosomal spreading by carefully grasping the coverslip with forceps on one edge and gently moving it slightly back and forth, trying to minimize any vertical pressure on the tissue. Alternatively use the eraser side of a pencil or even a fingertip to gently move the coverslip back and forth. Note that any delay in moving the coverslip back and forth is likely to diminish spreading of the chromosomal arms as they will tend to become more rigid upon exposure to the Lactoacetic acid solution. Clouding of the solution is often a good indication of cell separation. Gently tapping the coverslip obliquely (to avoid vertical pressure) with the eraser side of a pencil a few times may also assist in chromosomal spreading. Immediately examine the tissue under a phase contrast microscope with a 20 or 40X objective to determine whether the chromosomes are well-spread. When the chromosomal spreading is sufficient, set the slide with the coverslip side down on a stack of clean Kim-wipes. Place a second Kim-wipe on top and flatten chromosomes by placing your thumb over where the coverslip is positioned and pressing firmly, avoiding any horizontal movement of the coverslip that would shear the chromosomes. Examine the slide again under the microscope to determine if the preparation is suitable for the intended purpose. If chromosomes have moved significantly upon squashing, use less volume of Lactoacetic acid solution in your subsequent preparations. Repeat steps 4.1-4.8 until a sufficient number of suitable slides have been obtained. Place 175 g weights upon the coverslip of the slides. Fill a small Dewar (e.g., thermos bottle) with liquid nitrogen. Using a long forceps, dip slide into liquid N2 until the boiling stops, remove slide, and immediately use the edge of a clean razor blade at one corner to flip off the coverslip. If slide will be used immediately, place in a Coplin jar with PBS at 4°C. Otherwise collect the slide into a Coplin jar filled with 95% ethanol. Examine the coverslip once the frost has sublimed away to confirm that the tissue adhered to the slide and did not remain with the coverslip. Repeat with the remainder of the slides until all slides are stored in either PBS (for use within several hours) or ethanol (for longer term storage). The first critical step for obtaining high quality polytene squash preparation is to grow fat larvae with big salivary gland nuclei. The second is good technique with the spreading procedure, which may take some practice. One tip for improved spreading success is to find the minimal volume of lactoacetic acid solution during the squashing step. This will promote sufficient spreading of chromosomes without generating excessive streaming forces that can wash chromosome arms away. It is also worth noting that any delay in moving the coverslip back and forth will reduce spreading of the chromosomal arms as they become more rigid when exposed to the Lactoacetic acid solution. If everything goes well, there should be numerous well spread polytene chromosomes. Figure 1 shows an example of such a preparation, double labeled with a marker for interband regions in green and with a dye that stains the banded regions in blue. If insufficient spreading is obtained, the chromosomes will look like little balls, as shown in Figure 2. On the other hand, if too much spreading has occurred, the chomosomes will be too thin and extended or in some cases fragmented into small pieces as shown in Figure 3. Figure 1. Polytene squash preparation double labeled with antibody to the JIL-1 histone H3S10 kinase (in red) and Hoechst (blue). Figure 2. Polytene squash with insufficient spreading. Figure 3. Polytene squash with too much spreading. The inclusion of acetic and lactic acids in conventional squash fixation protocols facilitates both interband resolution and chromosomal arm spreading but unfortunately some epitopes do not survive this treatment. An example of such an epitope is H3S10ph (Cai et al., 2008). Since acid treatment also has the disadvantage that it quenches the inherent fluorescence of GFP-tagged proteins, DiMario et al. (2006) recently developed a formaldehyde-based "acid-free squash technique" that allow for direct visualization of GFP-fusion protein on polytene chromosomes without GFP-antibody labeling as well as for antibody detection of acid-sensitive epitopes. The modifications for this procedure are further described in detail in Johansen et al. (2009). A representative acid fixed polytene squash preparation double labeled with antibody to the JIL-1 histone H3S10 kinase and Hoechst is shown in Fig. 1. We thank Ms. V. Lephart for maintenance of fly stocks This work was supported by National Institutes for Health grant (GM62916) and National Science Foundation grant (MCB0817107). Cai, W., Bao, X., Deng, H., Jin, Y., Girton, J., Johansen, J., Johansen, K. M. RNA polymerase II-mediated transcription at active loci does not require histone H3S10 phosphorylation in Drosophila. Development. 135, 2917-2925 (2008). DiMario, P., Rosby, R., Cui, Z. 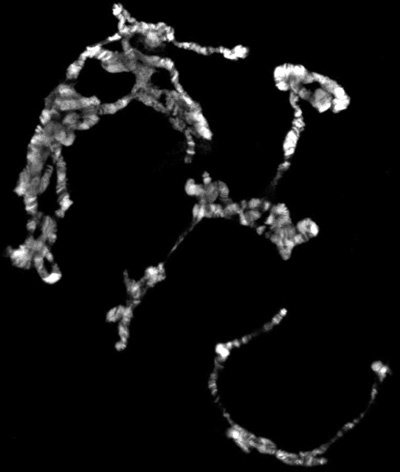 Direct visualization of GFP-fusion proteins on polytene chromosomes. Dros. Inf. Serv. 89, 115-118 (2006). Johansen, K. M., Cai, W., Deng, H., Bao, X., Zhang, W., Girton, J., Johansen, J. Methods for studying transcription and epigenetic chromatin modification in Drosophila polytene chromosome squash preparations using antibodies. Methods. 48, 387-397 (2009). Fixative 1. mix 50 ul 10X PBS, 5μl Triton X-100, 345 ul dH²O and 100 ul of 5X formaldehyde stock. Warm to disperse the Triton X-100. Fixative ². mix 150ul dH²O, ²50 ul Glacial Acetic Acid, and 100 ul of 5X formaldehyde stock. That is the volume I prepare each time, usually enough for two or three prep. You need to prepare 5X formaldehyde stock first and this stock you can keep in -²0°C for a long time. However the Fix1 and Fix² you need to prepare freshly. If you have any question you can send me another e-mail. Thanks! This may be a dumb question but when you put the tissue in Fixative 1 the Triton will lyse the membrane(s), correct? What keeps you from losing the chromosomes in either Fixative 1 and/or Fixative ²? Is it the PFA? The reason I ask is because I have followed your protocol and I see ALOT of tissue that resemble lysed cells (i.e. rounded edges with "tear" spots at various locations); however, I obtain very few polytene chromosomes? My thought is that they may be getting flushed out during my transfers. Do you have any advice? Thanks! You are right about the Triton. If you leave the glands in too long they will fall apart. The trick is to leave them in just long enough. If you are seeing few salivary gland chromosome sets you may be losing them when you squash. When you put them on the coverslip and then pick up the coverslip with the slide the chromosomes may float away to the edges of the cover slip if there is too much liquid present. Try placing them on the coverslip in a smaller drop of liquid and being careful about how you apply the pressure when you squash. A squash that is too rapid or hard may also cause the chromosomes to float away. The dissection forceps we use were mis-identified: they should be Dumont Style #5/Biology.